After six months of driving for the US application in the gridlocked city, da Silva launched his own rival service JaUbra in the sprawling northern district of Brasilandia in 2017. Since then some 50 drivers have registered and da Silva hopes to expand to other no-go areas of the metropolis of 12 million—the city with the highest number of Uber users in the world. Uber and other ride-sharing apps "started to veto the neighborhoods considered risky and difficult to access. But as we are already here, we don't have any trouble," says da Silva as he drives down the street where he was born 50 years ago, tooting his horn to greet residents. Few outsiders dare to enter parts of Brasilandia where many of its 265,000 inhabitants live in favelas made up of precarious multi-storey constructions squeezed into a labyrinth of streets covering the hills 15 kilometers (nine miles) from the center of Sao Paulo. And for those living in Brasilandia, the app is impossible to access from various points as AFP discovered during a recent visit. Other ride-sharing apps do not venture there at night either, complained a resident, who depends on public transport. "There are places here that are difficult for public transport to access and that's made us the only option for many people who were missing doctor appointments," says da Silva's daughter, Aline Landim, who gave up a bank job to dedicate herself full-time to JaUbra. Seeing the business's potential, Landim invested the pay-out she got from her former employer into JaUbra, which her father was running out of a garage and recording bookings on pieces of paper. Now they have their own app and are on the verge of migrating to a more sophisticated platform for which they have 500 drivers interested. "The people think that to start out you have to have a lot money, but we started with nothing," says Landim, 29, sitting in JaUbra's new location, a modest office they rented with the help of 32,000 reais ($8,300) funding from the local government and 20,000 reais from a start-up investor. "We only had a computer, a telephone, the idea, the creativity and the physical space loaned by a friend," she says. Despite making 3,000 trips a month and taking 15 percent commission on each journey, JaUbra's earnings are just enough to keep the family-run business afloat, says Landim, whose brother is also involved. It has not been easy launching a transport app on the outskirts of a city where high crime and yawning inequality go hand in hand. Life expectancy can vary by as much as 23 years between neighborhoods, according to a recent study. Vila Brasilandia, one of the zones inside the district, is ranked as the third most violent in Sao Paulo. Yet JaUbra has not recorded a single assault in the past year. "Since I joined the app, I haven't even suffered a scratch," says Nelson Cobertino, who started driving for JaUbra last year. 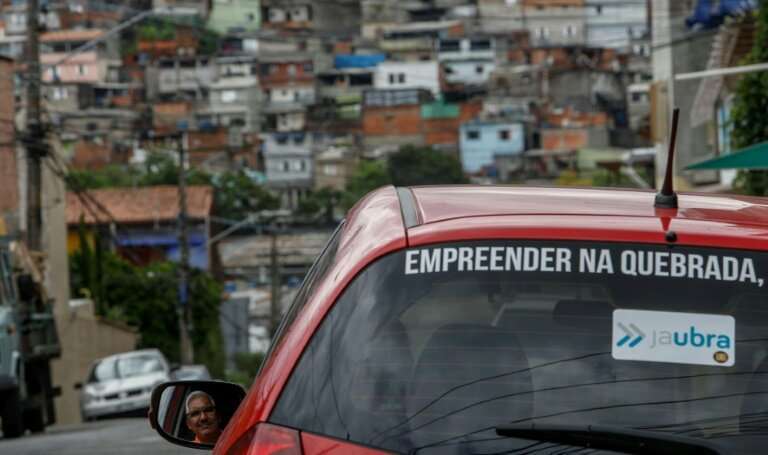 "When people see the (JaUbra) sticker they say 'it's from the neighborhood,' and then nobody hassles you because they know you are meeting a need and they respect that," says Cobertino, who used to drive for Uber and work in a bank. The US platform—which admits that it can block requests in certain areas and times of the day for security reasons—recently announced plans for a pilot program in Heliopolis, a favela in Sao Paulo's south, with designated pick-up points to increase its presence on the city's neglected outskirts. Uber also offers tailored service in Brazil for customers with old smartphones and slow internet connections as well as those who prefer to share their trip to save money. But da Silva is not scared by the competition. "At the beginning everyone thought that we wouldn't do it, that we would stop," he says. "But two years later and we're still here. I'm going to leave my family a legacy for the rest of their lives."